In the past several weeks, swollen rivers throughout the Midwest have become sources of death, devastation and destroyed livelihoods. 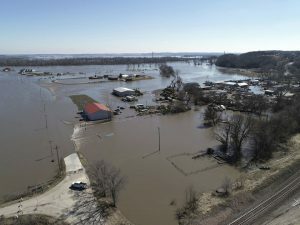 The region is recovering from the worst flooding in decades, as a deadly combination of rainfall accumulation in February, and heavy rain and snow from a powerful “bomb cyclone” brought mayhem from South Dakota to Missouri. Adding to the misery, the rain melted frozen waterways, creating car-size ice jams that plowed through farms, buried livestock and diverted water onto land. In all, thousands of homes and farms have been destroyed by the flood waters. At least two people and thousands of livestock animals have died. A conservative estimate puts the damage at $3 billion. Among the hardest hit have been farmers and ranchers, who now face thousands of acres of land under water and millions of dollars worth of ruined crops, both in the ground and in once-dry storage. And it’s not over yet. Another wicked storm is bringing more rain and snow to the region this week. Experts predict 200 million residents in 25 states face the risk of flooding through May. The historic floods have prompted our disaster recovery team at Good360 into action. Our first task was to go beyond the media coverage to understand what was really happening on the ground and find out what supplies would be needed. That led us to plug into conference calls that were launched by VOAD (Voluntary Organizations Active in Disaster) teams in Nebraska and South Dakota as soon as the flooding started. 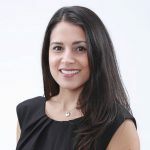 Separately, we have been in contact with officials from our long-time nonprofit partner, the Native American Heritage Association (NAHA), which helps fight food insecurity in eight reservations in South Dakota, including the Pine Ridge Indian Reservation. Having worked with Good360 previously, NAHA leaders alerted us to the plight of residents in Pine Ridge. 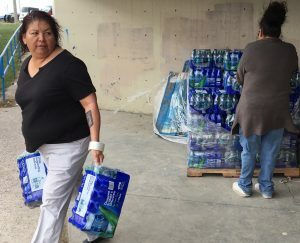 For days, people on the remote reservation had been stranded without adequate food or clean water. Fortunately, we were able to divert an existing donation of water given by Advance Auto Parts to send to the reservation. We also worked to secure a much larger donation of water from the Coca-Cola Company, with a logistical assist from UPS. That fortuitous collaboration came out of a series of disaster recovery forums hosted by Coca-Cola in Atlanta in partnership with other large companies and organizations, including Delta, Cox Media, IHG, GA Power, AT&T, The Home Depot, Warner Media, Mercedes Benz, State Farm, Carter’s, The American Red Cross, Salvation Army, Habitat for Humanity, CARE, Points of Light and United Way. 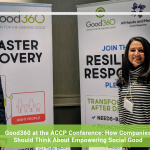 Good360 was invited to participate in that group, now called the Disaster Action Alliance. 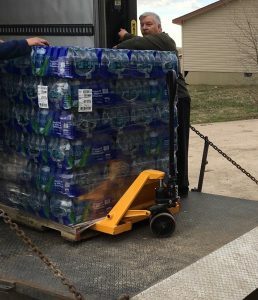 Since we had a previous relationship with UPS, we were able to facilitate a semi-tr uckload of Dasani bottled water from Atlanta to NAHA’s warehouse in Black Hawk, South Dakota, where the water was then distributed to families in Pine Ridge. In Nebraska, we determined that the most urgent needs comprised of personal care items that could be sent to temporary shelters, such as toothpaste, shampoo, wet wipes, pillows and underwear. 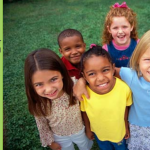 Conveniently, Good360’s national warehouse, where we pack and ship much of our donation catalog, is located in Omaha. Right now, many of the hardest-hit communities are still waiting to dry out. 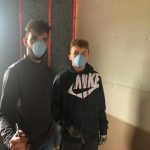 As they move from the immediate disaster to the recovery phase, we can help supply many of the items that will be needed for mucking and cleaning flooded homes such as shovels, sledge hammers, buckets, mold remover, and contractor bags. We know from previous natural disasters of this sort, including the Missouri floods of 2011, that a full recovery will take years. Farmers who lost their livelihoods along with their livestock, land, equipment and buildings will need to find a way to get back on their feet. Many families will need to rebuild their homes from the ground up. 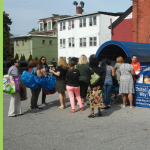 Since our giving model focuses on long-term disaster recovery, we’ll be looking for ways to support this journey with product donations from our partners. 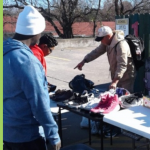 If you are associated with a corporation or organization that can help, please reach out to Jim Alvey at jalvey@good360.org.